Despite its name, the Hammond Avenue Presbyterian Church address is 1401 Belknap Street. The building stands at the corner of Belknap and Hammond, streets named for Robert Belknap and General John Hammond, officers of the Land and River Improvement Company (which owned most of Superior at the time—and donated the land for the building). 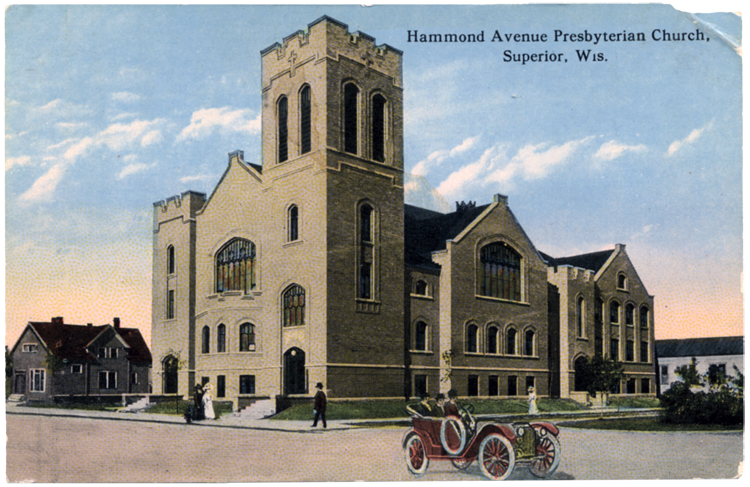 In 1998 Hammond Avenue Presbyterian merged with First Presbyterian—which had organized way back in in 1855—to become United Presbyterian. The Hammond Avenue Presbyterian building became the Harrington Arts Center after United Presbyterian built a new church in 2002. Many other Superior streets are associated with the Land Company. Hammond himself is credited for clearing and grading Tower, Ogden, and John Avenues; Ogden and John are named for his sons, and Tower takes its name from Charlemagne Tower, who developed the Vermilion Iron Range.